The Coil Capacitance Calculator can be used to calculate the self-capacitance of air-cored single-layer solenoid coils. All you have to do is enter your coil length and diameter and it will take care of the rest. It also uses data interpolation to give you more accurate results. 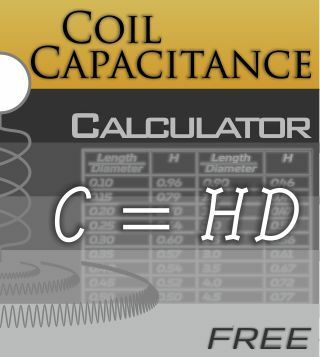 The Coil Capacitance Calculator is designed to calculate the self-capacitance of air-cored single-layer solenoid coils. All you have to do is enter your coil length and diameter and it will take care of the rest. Based on the data given in The Radiotron Designer’s Handbook, it also uses data interpolation to give you more accurate results. Works with metric and imperial units.